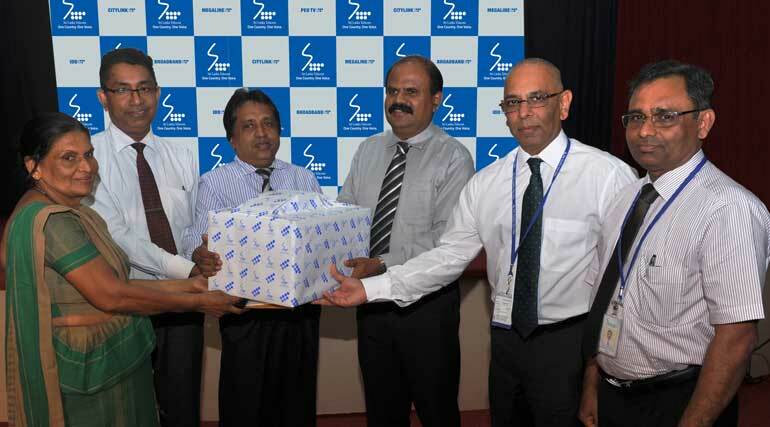 Sri Lanka Telecom (SLT), together with its employees donated medical equipment as well as medicines to the Cancer Hospital, Maharagama in an initiative to support and provide relief to patients at the hospital. SLT Chairman P.G. Kumarasinghe Sirisena and SLT Group CEO Dileepa Wijesundera symbolically handed over some equipment to Cancer Hospital Director Dr. Wilfred Kumarasiri during a special ceremony, which was organised by SLT recently at the company’s head office premises. Under this project, which was organised by the SLT Buddhist Society, the equipment and medicines were donated towards the bone marrow transplant unit to be opened soon at the hospital. The significance of this is that this bone marrow transplant unit is the first unit of this nature to be set up by a government hospital in Sri Lanka. Initiatives towards supporting this worthy cause were taken by SLT by inviting contributions from SLT employees. Together with the money collected from employees as well as the contribution made by SLT, the much-needed items that amounted to approximately Rs. 2.5 million were donated to the hospital. As explained by Dr. Kumarasiri during his address to those present, leukaemia patients have to travel to Singapore, India and other countries for treatment mainly due to the lack of bone marrow transplant facilities in Sri Lanka. This was very expensive and could not be afforded by all. However, with the introduction of this unit at the Cancer Hospital, Maharagama, now many more patients will be able to receive treatment in Sri Lanka itself. “We appreciate the generous and much needed contributions made by SLT towards the bone marrow transplant unit in our hospital. We have received a lot of support from the Government of Sri Lanka as well towards this project. Further, our supporters also include Australia Sri Lanka Association and bone marrow transplant specialists at St. Vincent’s Hospital, Australia who have provided training to our panel of doctors, nurses and paramedical staff and are continuing to work with us. Required medicines and equipment are very costly and we encourage other organisations also to follow the lead given by SLT and support us towards this unit which will help to save lives,” he said. Consultant Oncologist Dr. Prasad Abeysinghe was also present at the event. He explained to the gathering about bone marrow transplants as well as the progress of the setting up of the unit.